From 1865 to 1915, The Second Presbyterian Church occupied buildings at several downtown Kansas City locations, beginning with the first church at 809 Wyandotte. The congregation survived and flourished in the early years despite many setbacks, including a fire which destroyed the church building and manse at 13th and Central and continuing shifts in population. Realizing the need to follow the population further south, in 1916 Second Presbyterian settled in one of Kansas City’s first suburbs at 55th Street, between Brookside Blvd. and Oak Streets, where it makes its home today. The first unit of Second’s present structure was erected in 1916 (the side chapel or south wing of the church is now called the transept). The sanctuary was completed in 1917. The tower was enlarged and chimes installed in 1924 and the educational wing was built in 1956. The remodeling of the sanctuary, with installation of the new organ, complete rebuilding of the chancel and provision of the new stained glass windows, was finished in 1949. 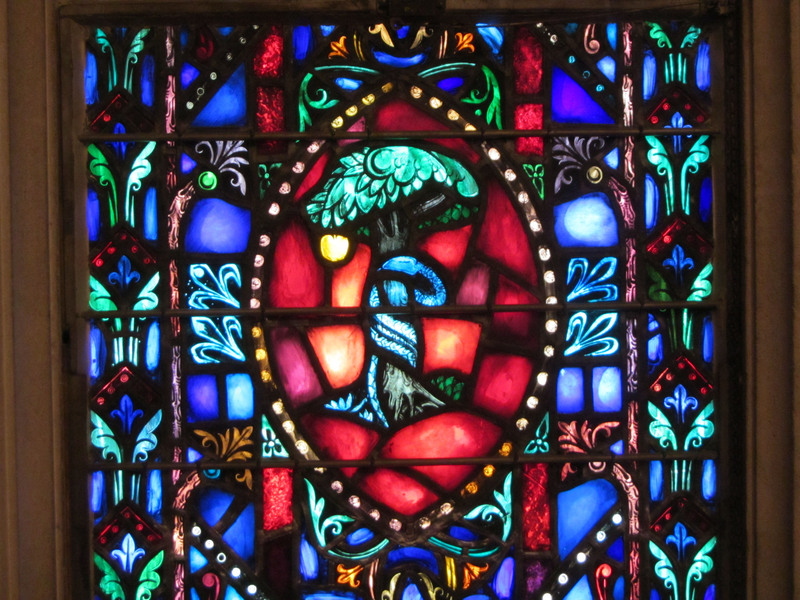 All of the windows are by Henry Lee Willett except for The “Ford” Window – (The Good Samaritan– by Tiffany) and the “Tough” Window- (Dorcas, the Servant Disciple – by J & R Lamb). The names of the designers of stained glass window are often unknown, but the designer of Dorcas, the Servant Disciple is clearly indicated as W. B. Hoover. The “Ford” Window (The Good Samaritan) is located in the rear of the church, at the east end of the nave. Mark 16:6; I Corinthians 15:4: , 20; John 14:19. The Rose Window high above the communion table depicts five symbols of the resurrection derived from Christian tradition. These are the blooming lily, the butterfly, peacock, the Phoenix bird and the pomegranate. 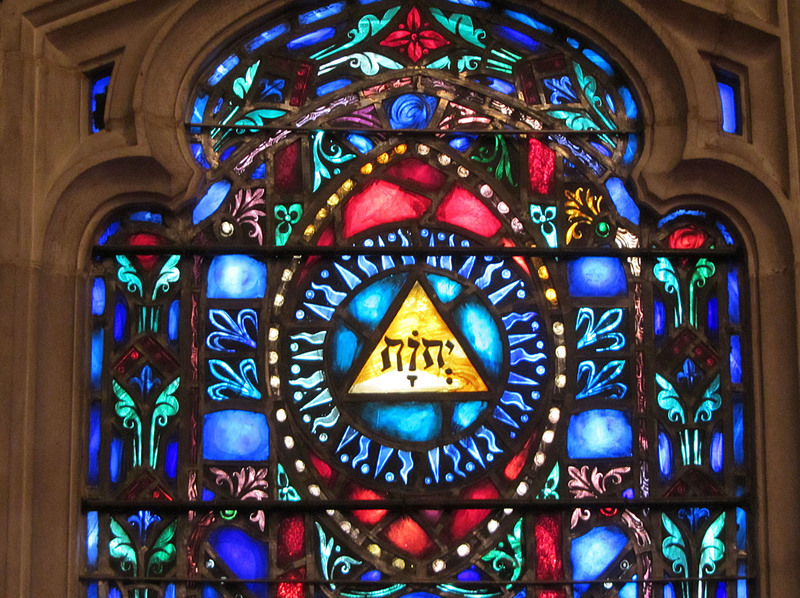 Windows of the nave, the main part of the sanctuary, contain symbols representing the long, progressive sweep of Bible history. Three large windows on the south wall portray the Old Testament; the five windows on the north wall depict the New Testament. Behold, I have seen a son of Jesse…and the Lord is with him. The Youth Window: Showing Christian education through teaching and recreation. The Founders Window: Showing a portrait of the founding pastor, Dr. Timothy Hill, and an illustration of the original building at 809 Wyandotte, Kansas City (1865-1915). John: The Chalice and a Serpent representing truth resisting the poison of sin. 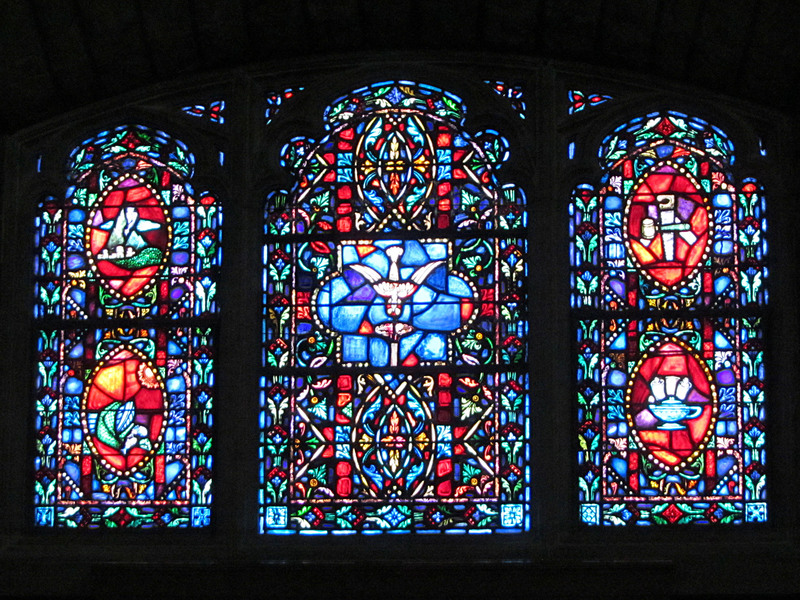 These windows symbolize the Church and the means of grace: Bible reading, Prayer, Attendance on the services and the Sacraments of the Church. The lamp of truth stands on the book which is the Bible. Beneath is the incense burner, surmounted by the letters Chi Rho. Psalm 141:2 and John 14:13. The Church is represented by an ancient symbol taken from a mosaic decoration taken at the apse in the Lateran Basilica in Rome. 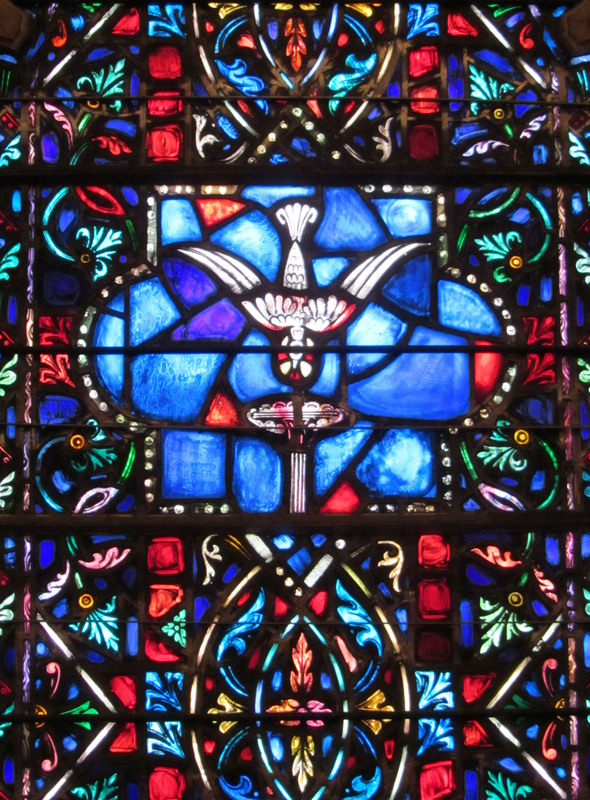 From the Holy Spirit, symbolizes by the dove, the water of life flows through Christ, indicated by the golden cross. The water then flows through the rock of the believer’s confession into life giving faith, symbolized by the garden, a paradise guarded by angels. Matthew 16:18. Christian life and fellowship are represented by a tree full of birds. The vine and the branches represent Christians as fruitful branches. Revelation 2:7 ; John 15:5.